YOU ARE LOOKING AT A2007-08 UPPER DECK MIKE RIBEIRO BIG PLAYMAKERS QUAD JERSEY CARD. CARD NUMBER #BP-RI. To CANADA. ONTARIO 13%. NEW BRUINSWICK 15%. NEWFOUNDLAND 15%. NOVA SCOTIA 15%. P.E.I. 14%. OUR OPINION : SEE SCAN CONDITION. All cards are NM or better. GREAT looking cards! QUEBEC 14.975%. BRITISH COLMBIA 5%. NON GRADED CARDS. P.E.I. 14%. NOVA SCOTIA 15%. To CANADA. The card number is #AF-MR. THE CARD NUMBER IS S-MRI. To CANADA. 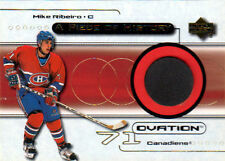 2006-07 UPPER DECK SERIES TWO MIKE RIBEIRO. CARD NUMBER IS J2-RI. To CANADA. 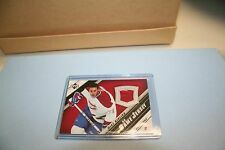 1x Mike Ribeiro 2005-06 UD # J2-MR GU Jersey. Montreal Canadians. 2005-06 Fleer Ultra MIKE RIBEIRO SCORING KINGS Jersey. To CANADA. Card #48 from the 2004-05 SP Authentic Buyback Autographed insert set. Card is serial numbered 45/53 made! Only 53 exist! ALMOST IMPOSSIBLE TO FIND THESE! All cards are NM or better. WITH VERY FEW EXCEPTIONS. A NICE 2005-06 Upper Deck Ice Fresh Ice Glass #FI-RI: MIKE RIBEIRO. 2008-09 SPX WINNING MATERIALS SPECTRUM # WM-MR MIKE RIBEIRO #63/99! MIKE RIBEIRO DUAL AUTHENTIC FABRICS. To CANADA. CARD NUMBER #AF-MR.